Here we will discuss how to collect Rainwater at home as well as cover the process of storing in barrels, maintaining the storage barrels and using rainwater in your home and garden. Water is one of our greatest natural resources and anyone who is in the process of 'going green' will want to take full advantage of harvesting and using it. However, when it rains, most of the water ends up in storm drain systems where it has to be treated to be recycled. But you can actually create systems to store and use rainwater where it will do the most good. You can also save money and natural resources by following a rainwater usage plan for your household. There are many reasons to store and use rainwater. It benefits both you and the environment around you. People have stored rainwater for thousands of years, so this isn’t a new idea. It’s just become more popular in recent years as we’ve learned what a great benefit it can be. Understanding more about these benefits can help you make the decision to begin using rainwater. 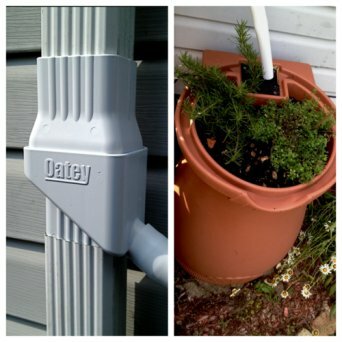 First, storing rainwater actually reduces flooding and erosion that can be caused by the downspout of your gutters. This can help keep your yard looking great and prevent water from ending up in storage drain systems. When you store and use rainwater, you can also save money. Normally, you have to pay for the water that you use to irrigate your lawn or to wash your car. But with stored rainwater, this becomes a free resource for you. When you use rainwater to water your plants, you’ll actually provide them with better nutrition. Rainwater is naturally full of minerals that are good for plants. It’s also free from pollutants and chemicals found in tap water. If you live in an area that can be prone to drought, storing rainwater can provide you with a water source during those dry times. City water sometimes becomes restricted during drought conditions, but your rain barrels will be accessible to you. When it comes to the environment, freshwater is an extremely limited resource. Only 3% of the world’s water supply is able to be used for drinking and other home use. Because water consumption is high in industrialized countries, natural sources of water are beginning to dry up. Harvesting rainwater captures a renewable resource and prevents water from entering storm drainage systems where it can become contaminated. Collecting rainwater has become a popular way to conserve water in recent years. That’s good news - because it’s made it possible to find many different systems for storing it. One of the most popular and least expensive methods is using a rain barrel. Rain barrels are large containers that can collect rainwater from the gutters of your home. They can be made from materials such as large trash cans or buckets. You can also purchase commercial kits that you can put together easily designed specifically for storing rainwater. 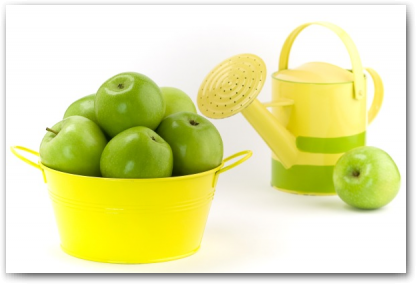 Once you have a system in place, your bucket will begin to fill each time it rains. With a rain barrel it’s important to make sure you take some safety precautions. For example, the top needs to have a child and pet proof top that doesn’t allow small ones to fall in. You also need to have a filter at the top that prevents debris from going into the barrel along with the rainwater. If you find that this system works well for you, you can even add multiple barrels so that you don’t have any overflow during a rainy season. Rain barrels typically have a tap at the bottom for you to remove the water. 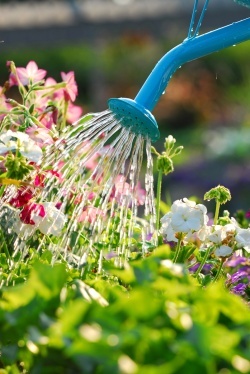 Some of them allow you to attach a standard garden hose so that you can use the water directly in your yard. Always make sure that any material you use for your rain barrel is food grade. This means it won’t leach harmful chemicals into the water and the water will be safe to use. 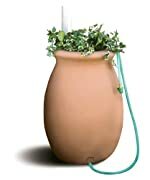 A rain barrel typically holds around 50 gallons of water for use. You can have several barrels to hold more water. But if you’re interested in storing much more, you’ll need a different type of collection system. One choice is called the Rainwater Pillow. 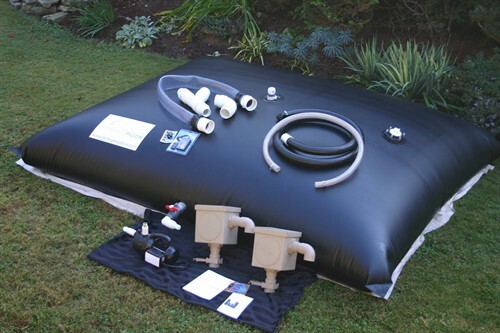 The Rainwater Pillow is a system that holds up to 1,000 or more gallons of water using a fabric container. The amount it holds will depend on the size that you purchase. For the typical homeowner, the original 1,000 gallon size is sufficient. You can also invest in an underground system that catches rainwater and allows you to pump it out for use. You can purchase a system that will provide water for your lawn and garden, but can also be used for toilets. This system is quite a bit more expensive (at around $2,500) than other options because of its size, underground placement, and materials. However, it can pay for itself in the long run by replacing your dependence on other water supplies. In order to have this type of system, you’ll want to look in your local area for a company that specializes in it. The cost will depend on your area and your specific needs. This is a real concern as debris can contaminate the water in your barrel. A great solution for this is to use a first flush system. The first rain you’ve had is usually the most polluted as it washes away debris. With a first flush system, the first five or even 10 gallons of water are stored and set aside from the rest of your rain barrel storage. This is the water most likely to end up with sediments or chemicals. Once you have a rain barrel, there are things you’ll need to do to keep it in good condition so that you can make use of the water you’ve stored. These simple steps will help you get the most of your system. First, you should empty your barrel at least once a month. This keeps water from accumulating algae and developing an unpleasant smell. If you want to be able to allow water to sit longer, you can add a capful of chlorine bleach to the barrel. This will stop the development of algae and at that small concentration it won’t harm your plants. However, if you use more than that, it could become harmful. You also want to avoid using an acid such as vinegar because it will harm your plants. When it comes to your gutters, you’ll want to make sure that you clean them regularly or install a gutter screen that prevents debris from getting in. This will cut down on the debris and sediment that gets into your rain barrel. If you notice that your barrel has developed a leak, you don’t have to throw it out. In many cases you can use aquarium caulk made from silicone to seal up the hole. 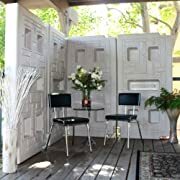 This is available in hardware stores and is inexpensive. Another concern for rainwater barrels is the development of mosquito populations. Draining the barrel regularly is one way to prevent this. But you can also add a larvae tablet to your barrel that can prevent mosquitoes from breeding. Adding this type of tablet won’t harm your plants and will prevent problems such as West Nile virus that can be spread through contact with mosquitoes. You also need to be careful if you live in an area with very cold winters. Freezing and thawing over and over again can weaken your rain barrel. 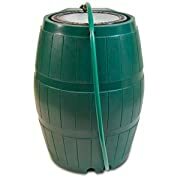 Before it gets that cold, drain your barrel and disconnect it to prevent problems. When you’re storing your rain barrel for extended periods of time, it’s best to store them upside down. This keeps them free from debris. You may think it will take a long time to collect water in your rain barrel. But you can actually collect thousands of gallons a year. You can figure out approximately how much water you’ll collect for every inch of rainfall. First, you’ll need to estimate the square footage of your roof. Then divide that number in half. The number you end up with is the number of gallons of water you can collect from one inch of rainfall. The average house can collect over 400 gallons of water with a half inch of rain. As you can imagine, that adds up fast during rainy seasons. This is a great reason to have multiple barrels or larger systems. Rainwater isn’t usually used for drinking (although it can be), but it can be used for many other purposes. It may surprise you to see how many different ways you can use stored rainwater. The most obvious use for rainwater that you collect is watering your lawn and garden. It can be costly to water your yard during dry and hot summer months. Having a rainwater storage system allows you to have access to free water. It will also allow you to continue watering even if your water service has imposed restrictions due to drought. One of the easiest ways to use your barrel is to connect it to a soaker hose. You can use it to keep your lawn irrigated and you can even use it to protect the foundation of your home. While this isn’t available everywhere, many cities allow residents to use rainwater to flush toilets. You can even set up a rainwater system where the water is automatically brought into your home for toilet flushing. If you own an automobile, you can use rainwater to fill your radiator instead of the tap water you might normally use. In most cases this will need to be mixed with antifreeze. You can also use rainwater to wash your car instead of hooking up the hose to the city water system. This will save money and conserve the water you would normally use. When you need to clean your home, you can use rainwater instead of tap water to mop. Simply fill a bucket and bring it inside to clean your floors and other surfaces. You can use rainwater for washing dishes and even for bathing if you have a filter system to make it better for use inside. It can also be used for laundry. Laundry actually makes up a large percentage of water use in households, so this can save a lot of money. Having water stored in rain barrels can help you if you have a natural disaster or other emergency that keeps you from being able to use your typical water supply. You’ll want to make sure that you have filtration and purification tools before using it. You can even share the water you’ve collected with neighbors if you have more than you can use. 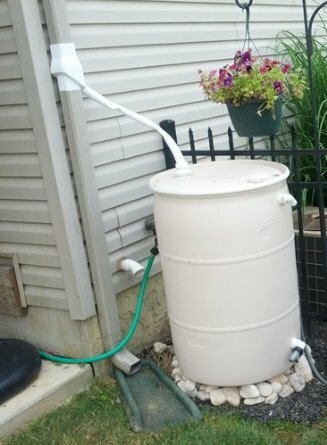 This can serve as a great example and encourage others to install their own rain barrel systems. A lot of times, failure to get the most benefit from going green is the result of a lack of knowledge or understanding. You’ll be surprised about how much a little research can help you with things like learning how to collect rainwater at home. Below here I'm featuring more pages with helpful how-to-do-it tips on how to collect rainwater at home. Feel free to submit your own story or article about going green, and I will create your own page here with your contribution for the community to read. Back to HOME PAGE of this how to collect rainwater at home section of the site.